Mumbai : The sessions court of Mumbai on Thursday rejected the anticipatory bail application of self-styled and the controversial god-woman Radhe Maa in connection with a case of dowry harassment. 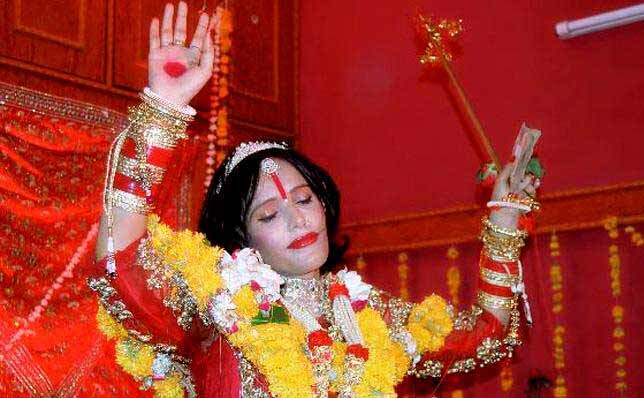 The controversial god-woman Radhe Maa has been accused in a dowry harassment case, and recently she has filed an anticipatory bail in the Mumbai sessions court. On August 5th the Mumbai police has filed a case against Radhe Maa for instigating in-laws of a 32-year-old woman to harass her for dowry. While, Television actor and former devotee of controversial the god woman, Dolly Bindra, had earlier today written to the Mumbai Police Commissioner complaining that she has received threatening calls and said that she suspected Radhe Maa's involvement in the matter. Sukhvinder Kaur alias Radhe Maa filed the pre-arrest bail application yesterday. She denied all the allegations, saying she never instigated the family members and that she was being dragged into the matter only because the complainant's in-laws were her devotees. "The complainant has made allegations only to ventilate her frustrations and dejection for being unsuccessful in securing a favourable order from the family court," Radhe Maa's application said. Advocate Ashok Gupte, her lawyer, said his client was being framed up. The police had summoned her for questioning tomorrow but she feared arrest, he said. The complainant's lawyer, advocate Sunny Wasker, however argued that Radhe Maa was an important person and she had instigated the family. Ever since the complaint was lodged, his client was getting threat calls, he claimed. Radhe Maa was the decision-maker in the family, and the complainant couldn't even go out without her permission, the lawyer alleged. "She was forced to do domestic work at the house for Radhe Maa and whenever she refused she was beaten up." The public prosecutor contended that police had only summoned Radhe Maa for the purpose of investigation and if she had noting to hide, she should not fear arrest.